Long time amigo, Rick Kasper, went fishing with his son, Kasey and friend Mario from Texas and had a pretty good day with some nice dorado and a striped marlin they were unable to release after it swallowed the lure. Both marlin, sailfish and dorado were good bets this past week. 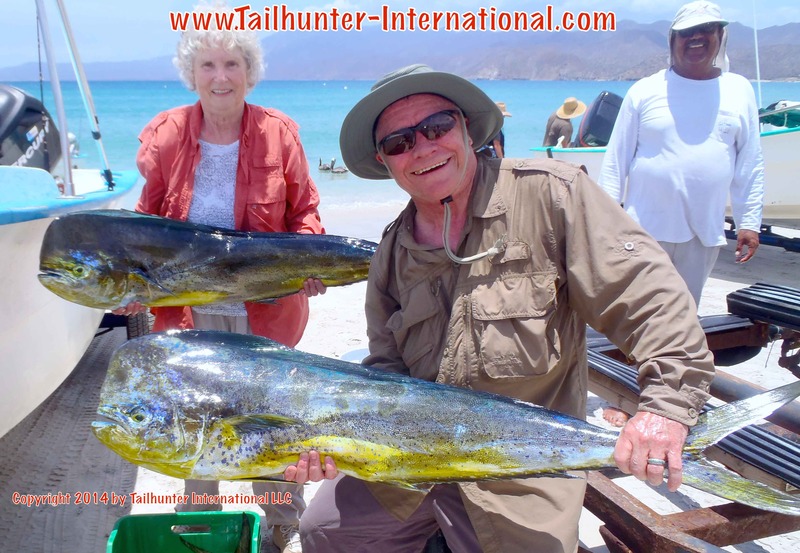 From Arizona, Jolly Jaeger and husband Dwight came down this week and took some of the nice bull dorado that have been showing up recently. Johnny Enright brought grandson Dawson down for 3 days of fishing and show off a trophy dorado and some others on the rack. However, check out the big pompano also on the rack. It’s our first of the season! 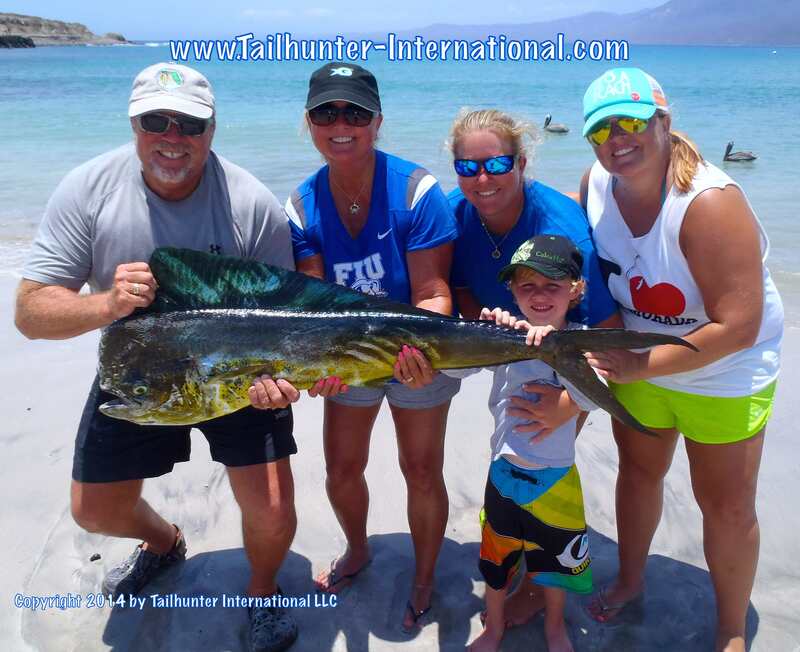 Every year, Don and Debbie White from Oregon come spend a few weeks with us and always catch fish! This particular day, they not only got dorado you see here, but also caught and released a blue marlin estimated at about 120 pounds. Three years ago when he was 9 years-old, Garrett Santana came down to fish with us and got into some nice dorado. He came to visit us again this past week and not only caught a mess of dorado, but also put the wood to this huge sailfish all by himself and refused any help! Captain Raul helps out. Nicely done, youngster! Rex Smith from Phoenix, Arizona has been visiting us for years. 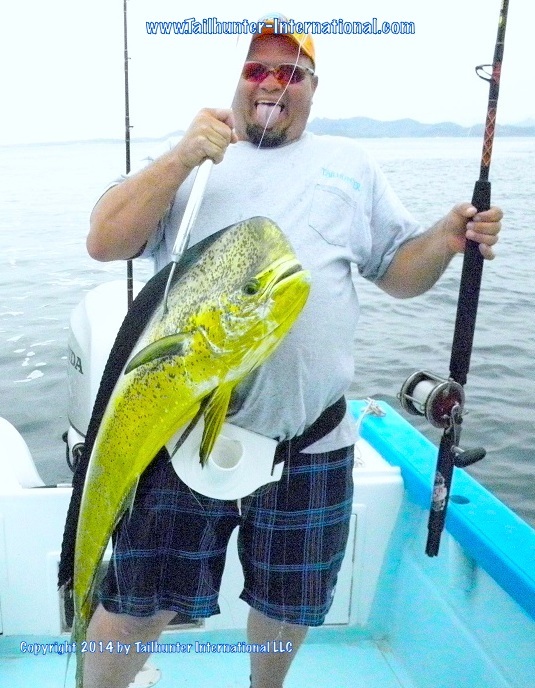 As usual, he caught lots of dorado, but over the years had never caught a pargo…until this past week! 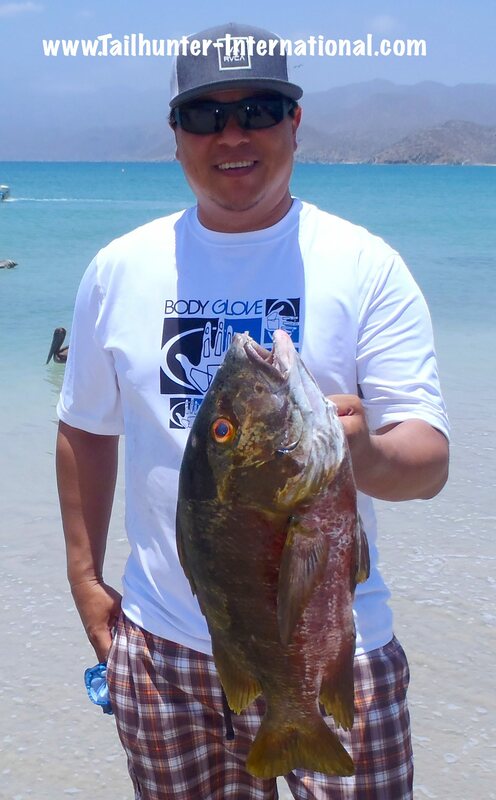 He took this tasty pargo mulato (barred pargo) fishing withour Tailhunter La Paz Fleet. 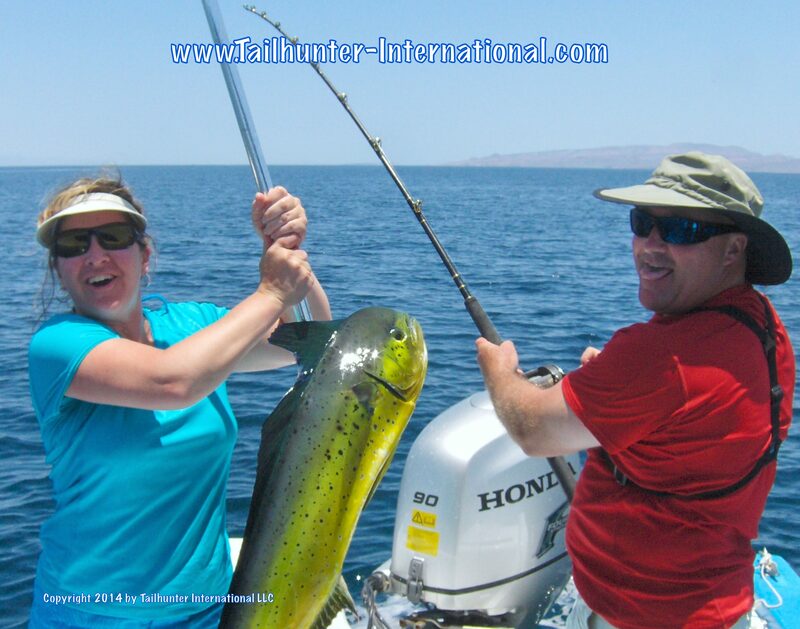 Our wine-making friends from Yakima, Washington, Chuck and Claudia Fiola had fun with the dorado and fishing with our Tailhunter La Paz fleet last week. 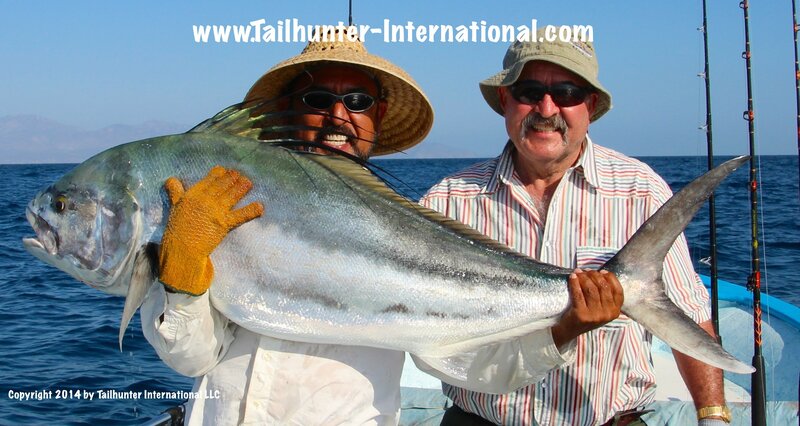 Big smile from our Captain Victor as he hoists up Jolly Jaeger’s bull dorado. Check out the video below of her pulling in the fish. Well done! Our Captain Boli has a funny face for the camera, but it’s all smiles for Carson Vincent who had never gotten a dorado before and was brought down by dad to give it a go! Dad got some video of Carson pulling in the nice fish below. Check it out. Well done, Carson! DORADO KEEP RODS BENT FOR THE WEEK RAIN ON THE WAY? It wasn’t a bad week of fishing. It was a “mixed” week of fishing. Dorado surely did their part and kept everyone smiling, but things seemed to change from Las Arenas to La Paz and from day-to-day and indeed from one pangs-to-the-next! We sort of re-bounded from last week when fishing was sluggish and all we had were some more of those pesky mosquito-size dorado everywhere. It might have been a combination of lack of bait coupled with the fact that last week there were SOOOO many boats out there on the fishing grounds the fish just got lock jawed! This week was much better. The biggest news was a splash of tuna…yes 15-40 pound yellowfin tuna that made their first appearance off Cerralvo Island and several boats got into them. Usually, these fish are moving too fast and no one can get into them, but we also had a school of 50 pounders that went crashing by some shocked fishermen at the north end of the island as well. So, the fish are around and hopefully, we’ll see more of them because in subsequent days, our recon trips to look for the school went for nothing. However, the dorado were surely more cooperative. Some larger fish in the 20-40 pound class were taken, plus more billfish including some blue marlin we hooked and either lost or released. Much better for quality and quantity this week for dorado. Fish ran 10-40 pounds and limits were common with many fish lost and many released. We do have live bait in the form of caballitos and mackerel, but a big error with the fishermen is not letting the dorado really chomp down on the baits and giving the dorado enough time to get the hooks in their mouths. These dorado are so voracious that even small dorado will charge baits that areas big as them making you wonder how they even get an 8 inch bait into their little mouths. But, they will hit it so you just have to be patient before pulling the trigger and setting the hooks. 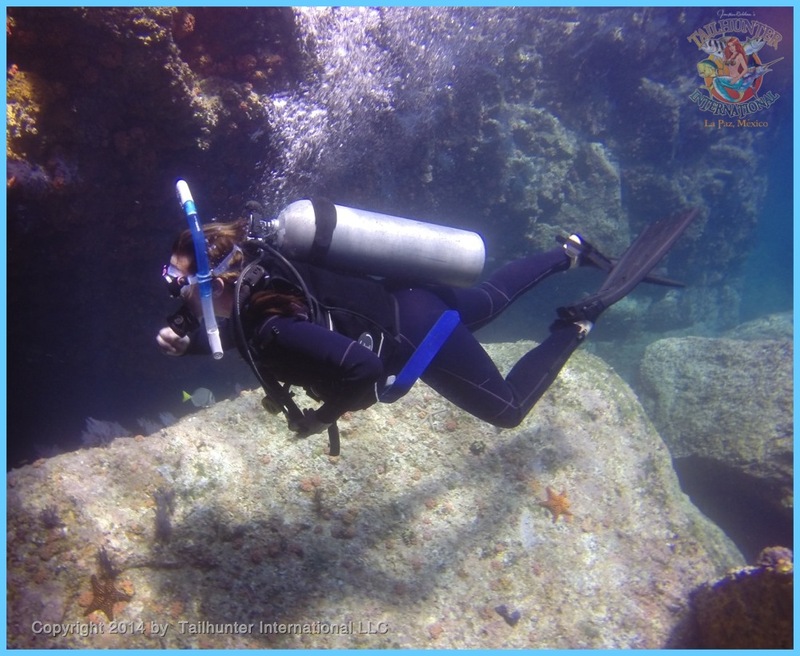 The fish are around Espirito Santo Island and as close as right in La Paz Bay, but the larger fish are all the way around the corner around Las Cruces, El Rosario and Punta Gorda. It takes while to get there, but it’s worth it and the fish can be as close as just a few yards off the beach in the calm protected waters near those areas. We are also getting some good bites on sailfish and marlin as well in the same areas. 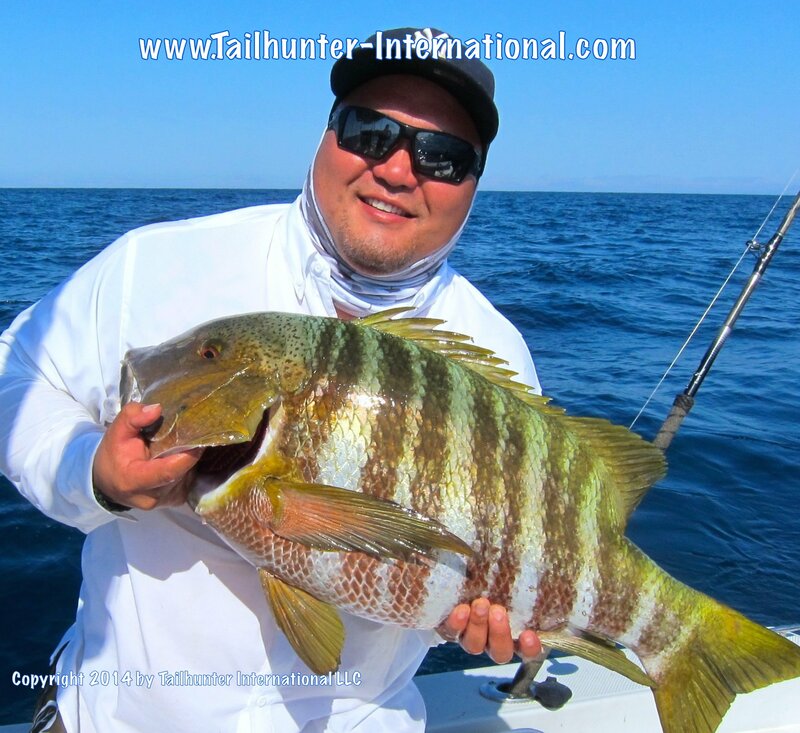 OTHER SPECIES: Since everyone is concentrating on the blue water species like dorado, we’ve found some spots holding some BIG cabrilla and pargo that are willing to bite, but getting these beasts out’ve the rocks once you hook them is the trick and the fish usually wins! Seriously, it’s been a tad humid and in the mid 90’s, but this week the forecast is showing some afternoon thundershowers coming our way. Very tropical. I don’t think it will affect our fishermen very much and, as of the time of this writing, these are not hurricanes, but merely some rain cells moving our way. We’ll keep an eye out! Might actually be very refreshing! 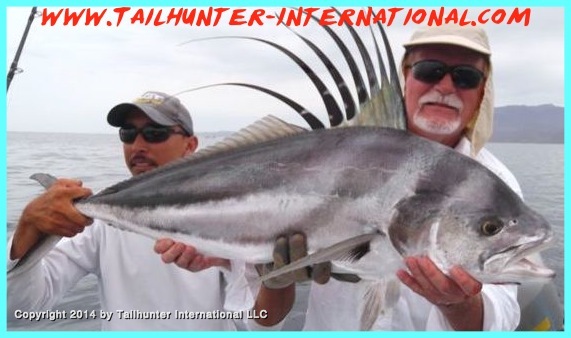 From Ontario, Oregon, Bob Chadwick was able to tick “roosterfish” off his bucket list with this outstanding rooster caught on a live ladyfish and released just outside of Bahia de Los Muertos with Captain Armando. Florida in the house! 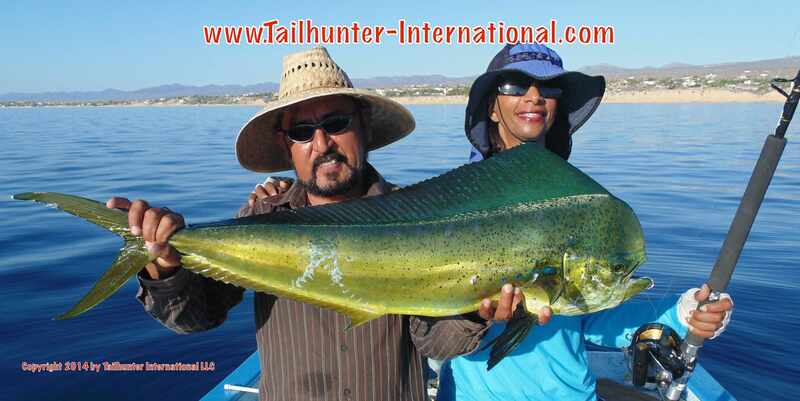 Captain Victor gives Beth Nichols a hand with another nice bull dorado. Cerralvo Island in the background. Amy Kasper by way of Wyoming hits a pose after another good day of fishing with her husband, Rick and Captain Jorge at Las Arenas. 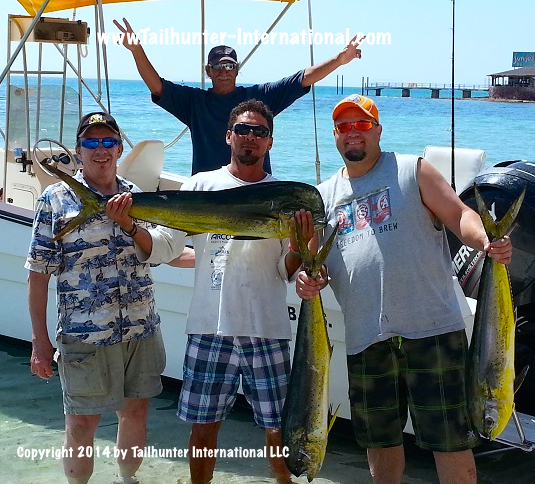 They got nice limits of dorado. When she’s not vacationing, Katie Nichols from Florida actually skippers a commercial fishing boat in Florida for her family getting lobster and crab! She’s pretty good with roosterfish too! She caught and released this fish near Punta Perrico. The ladies were on fire this week with the fishing! 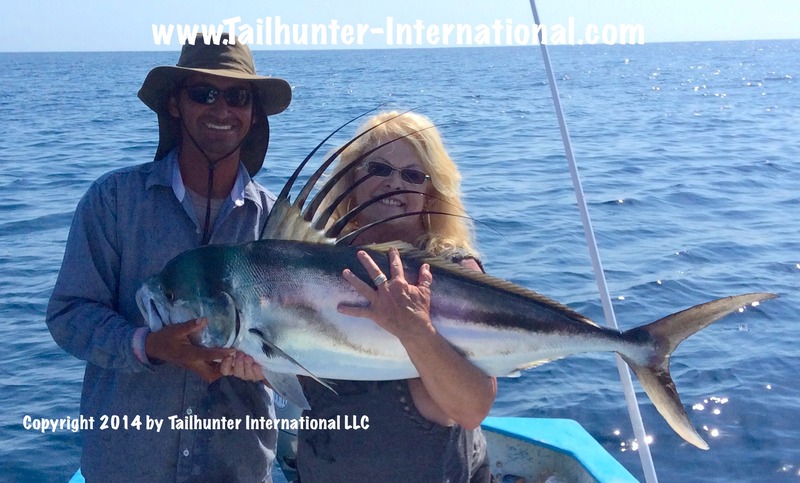 Patti Buffington lives up in California wine country and had a nice day on the water with her husband and Captain Adolfo catching and releasing a trophy rooster. Good fish to be caught, but overall, an erratic week of fishing. It was hard to describe this week. There were definitely some great fish to be caught and good fishing to be had, but the “what…where…why…and how” aspects of the fishing equation threw so many variables into the mix that there’s no way to completely get a fix on what happened. Tougher fishing this past week and I attribute it to several things. The lack of live bait doesn’t make it easy. There is “some” live bait, but mostly, we were using a combination of some live bait with a bigger mix of dead frozen ballyhoo, chunked and stripped bonito as well as caballitos. They all worked, but not as well as live bait. The bait situation is a bit dire to begin with, as I have often described. All of the Baja is hurting. Much of it is due to the cyclical “El Nino” situations we’re experiencing with extremely warm waters hurting the bait stocks. Secondly, I don’t know what it was this week, but I can’t remember when I’ve ever seen so many pangas on the water. We had several vans of our own full of fishermen each day , but it was just an incredibly busy week out there. Our competitors also had a van or two. Visiting guide services also had a van or two. There were alot of independent fishermen in their own boats. There were scores of commercial fishermen. There were alot of free diving spear fishermen in the water as well (not exactly the best mix when there are fishermen in the same areas as the divers!). It looked like a freeway out there! Everyone needs bait. So, that meant that the bait was truly depleted. Additionally, so much traffic on the water didn’t do the fishing any favors. We only had a few wahoo hook-ups this week. The billfish bite wasn’t as hearty although there were a few stripers hooked and one blue estimated at over 400 pounds . The rooster fish were a bit more scarce as well. About the only thing really going on were the tons of 3-5 pound “mini-dorado” all over the place. But that gets pretty old after awhile hooking trout-sized dorado! So, maybe this upcoming week will be lighter and things will turn around. There were a few cabrilla and pargo in the mix and some large bonito. We fared much better with our La Paz fleet this week. And the big difference…LIVE BAIT! We had caballitos, big sardines and, and mackerel. And that makes all the difference in the world. Working the island as well as around the corner around El Rosario, Las Cruces and Punta Gorda some nice quietly 20-40 pound dorado were common. There weren’t many of them, but each panga was getting 4-6 of the nicer sized ones and throwing back many smaller. The big ticket is letting the fish “eat” the bait and waiting until it really has the bait down it’s throat. The baits are bigger than we normally have so give the fish time to really chew-down on the bait before setting the hook. So many fish were lost because anxious anglers pulled the trigger too fast and the bait right out’ve the fish’s mouths! 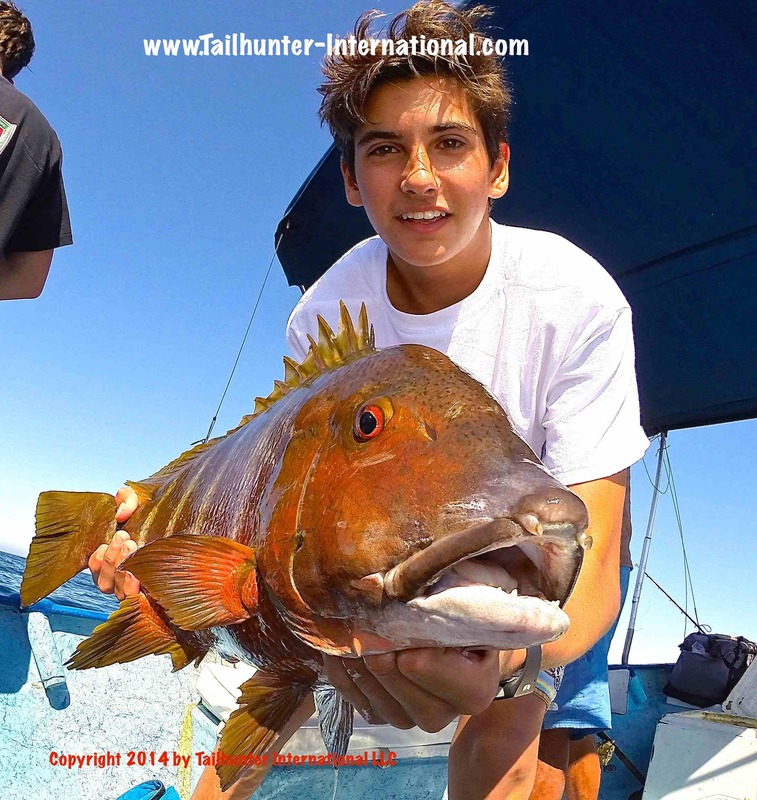 Sidebar: Some nice roosters along the beaches…amberjack…cabrilla and pargo. 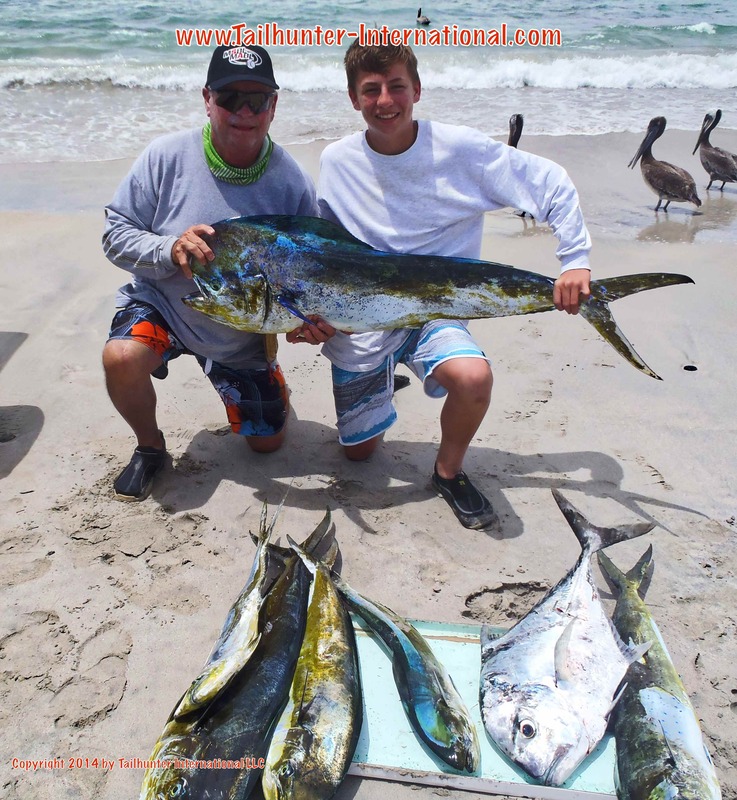 2014 PANGA SLAM – FISHING AND PARTY FUN! The “Rogues Gallery” group portrait day 3 Panga Slam 2014 at Balandra Bay with some of the catch of big dorado! Great time and great way to end the event! Money shot for Angela! This fish was worth about 500 bucks to Angela Farrell from Oceanside CA who has fished with us many times and always does well. This 20-pound-bill was big enough to take first place on the 2nd day of fishing at the Panga Slam! She almost won the 3rd day as well with a fish that was barely one pound lighter than the winner! One the 3rd and last day, the fish got bigger with many fish between 20 and 25 pounds! 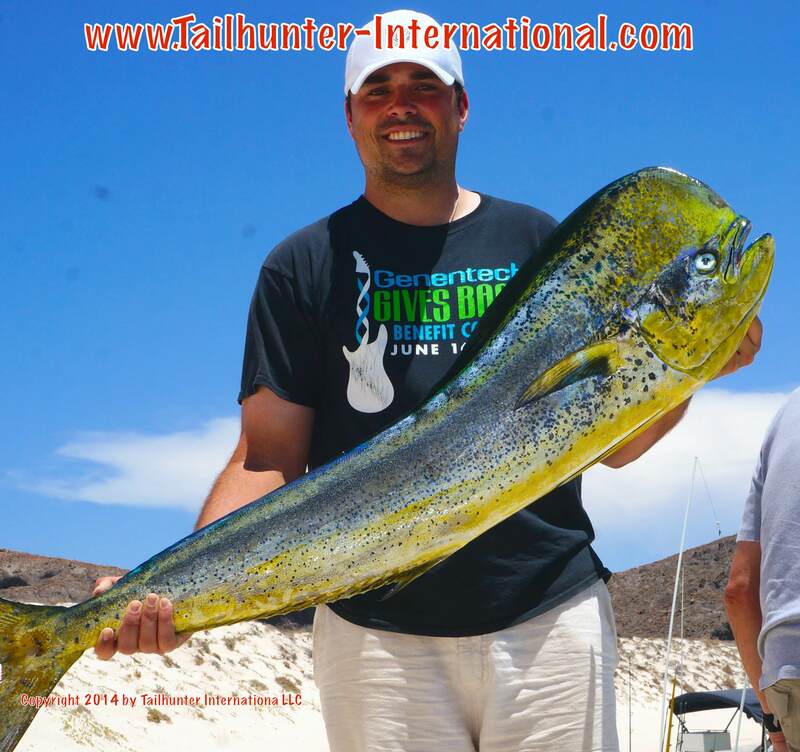 However, the big winner was this 30.5 pound bull dorado for Christian Regan who took the fish on a live caballito! 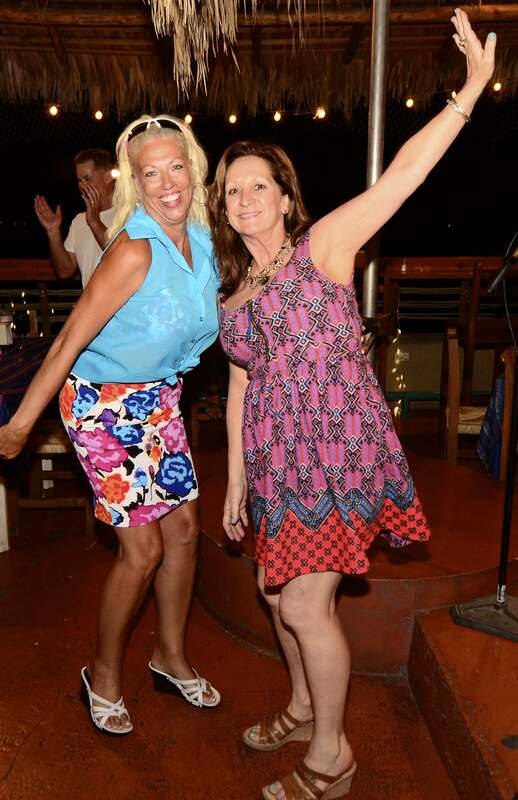 Shaking it loose on the Tailhunter dance floor! The gang gives a shout-out from the 2nd floor terrace at Tailhunter Restaurant! 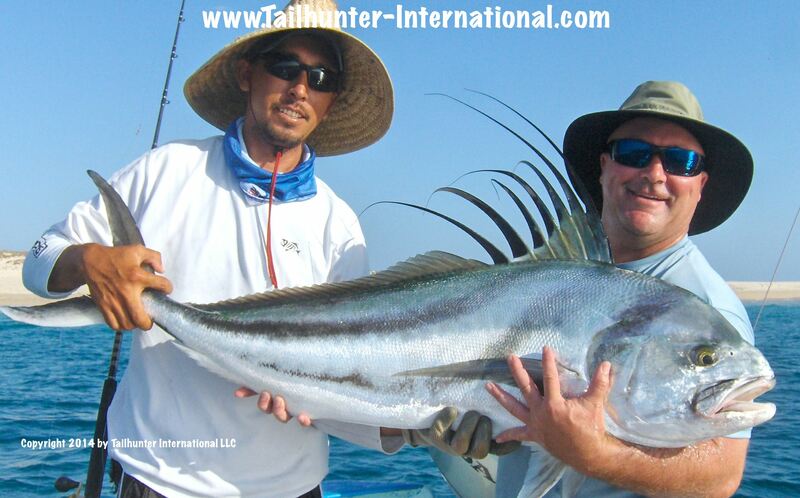 Kudos to Tim Farrell who tagged two roosterfish for the Roosterfish Foundation and released them swimming strongly. 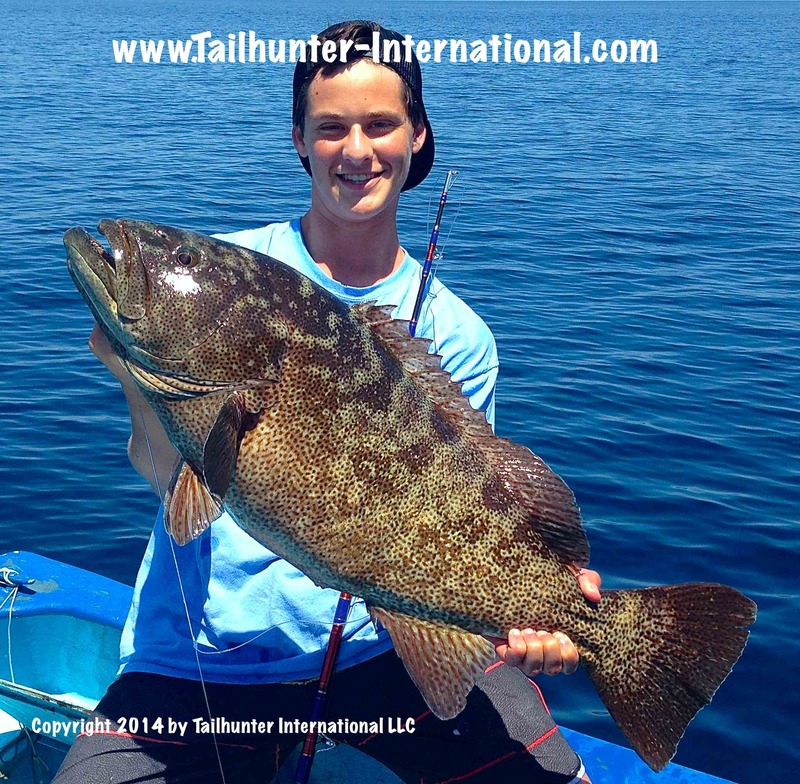 One of the fish might have potential as an IGFA world-record release fish! Benny wails and make his guitar talk! Gary and Michele party up on the dance floor! Show me the money! Christian Regan shows off his winnings for the 3rd day of fishing. Dad Randy is gonna hit him up to pay off the beer tab! Always in the fish! 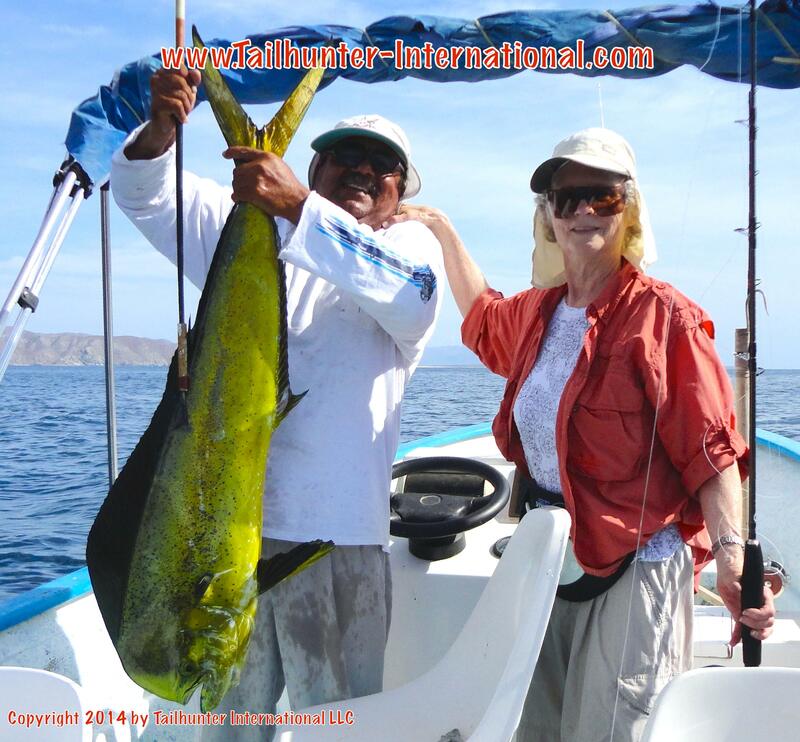 Verda Boyd and her guy…Captain Jorge…fishing just off El Sargento/ La Ventana found one of the larger bull dorado cruising the area the last few days. She and husband Tim, always hit the fish! Nice flat water too! Jilly and Michele funning on the Tailhunter 3rd floor! Pat in the back showing the size of the fish that got away! 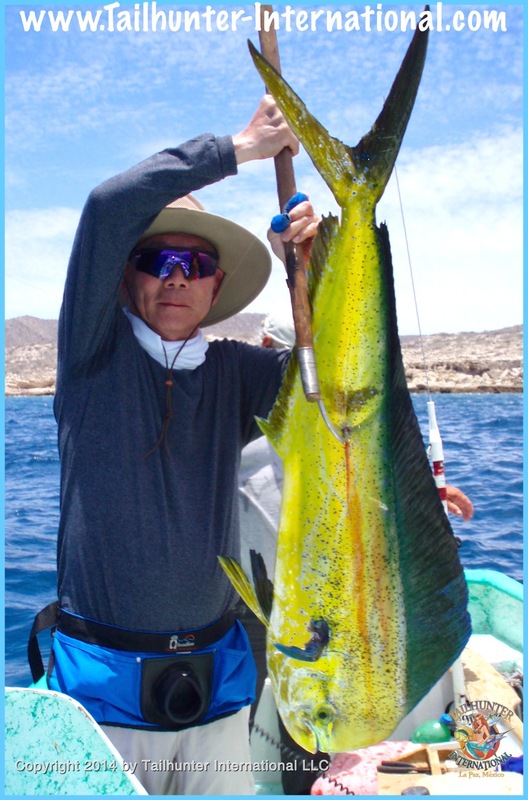 Tim Zimmer, our recently -retired amigo from the Bay Area of California put this colorful bull dorado in the boat after the 3rd day of fishing out’ve La Paz. 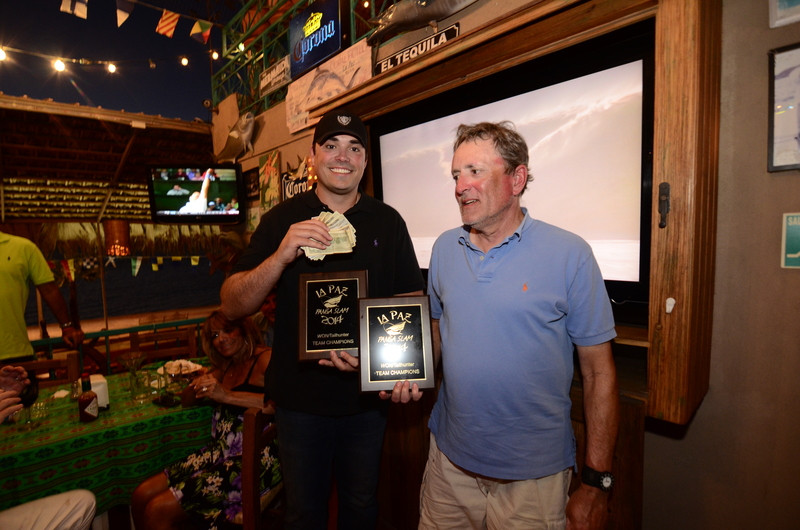 Our first annual 2014 Panga Slam co-hosted by Western Outdoor News and sponsored by Costa Sunglasses, Tro-kar Hooks, Suffix Line, Okuma Reels and Turners Outdoors, was a grand success with lots of old and new friends and even a few nice fish thrown in! Everyone got right into it after checking into their rooms at La Concha Beach Resort. Margaritas and cold beers quickly hit the tables and master of ceremonies Pat McDonell kicked things off and photographer and famous outdoor author Gary Graham was taking photos and a huge buffet dinner on the beach was served by the hotel with lots of great giveaways from our sponsors. First day was a non-tournament day but everyone headed to Bahia de Los Muertos for the initial day. Lots of small dorado…a few medium ones…some jacks and bonito and a marlin were all tallied for the day then we all retreated back to La Paz for an all-you-can-eat taco feed at Tailhunter Restaurant and live reggae music from the Stamina band and some good dancing on the 2nd and 3rd floor! 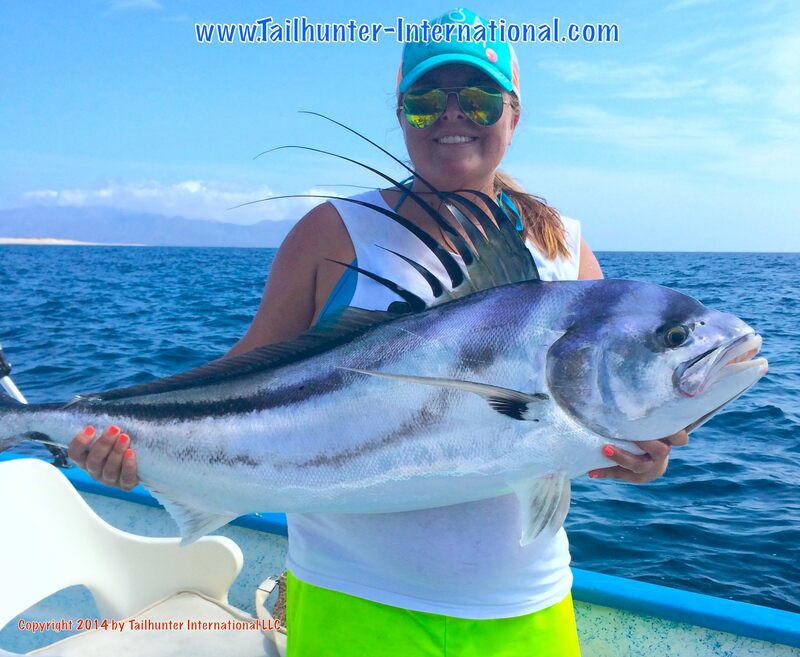 Day two had us all heading back out to Las Arenas for more small dorado action…some nice roosterfish and a jackpot dorado from Angela “The Poster Girl” Zapien who nailed it with a 20 pound bull that put $550 dollars in her pocket from the pot. That night, it was a free night but a big group of us went for clams, shrimp and lobster to Pichilingue restaurant on the beach. Toes-in-the-sand and cold beers under a palapa roof to watch the sunset. 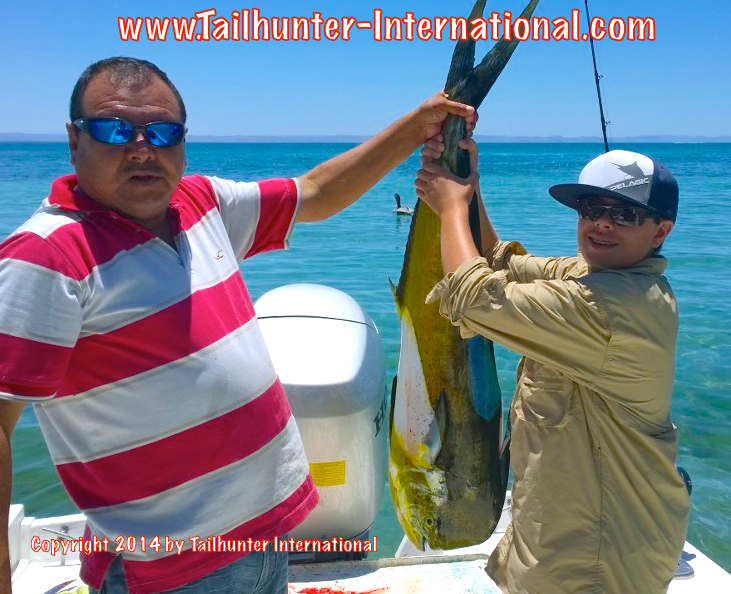 Our 3rd and last day, we changed tactics and had everyone got out to fish at La Paz north out’ve the bay. Big difference! Big fish showed up with every boat taking 18-30 pound big bulls! It was a great way to top out the 3 days and the day’s jackpot going to Christian Regan who edged out some other big fish with a 30.5 pound big bull dorado. 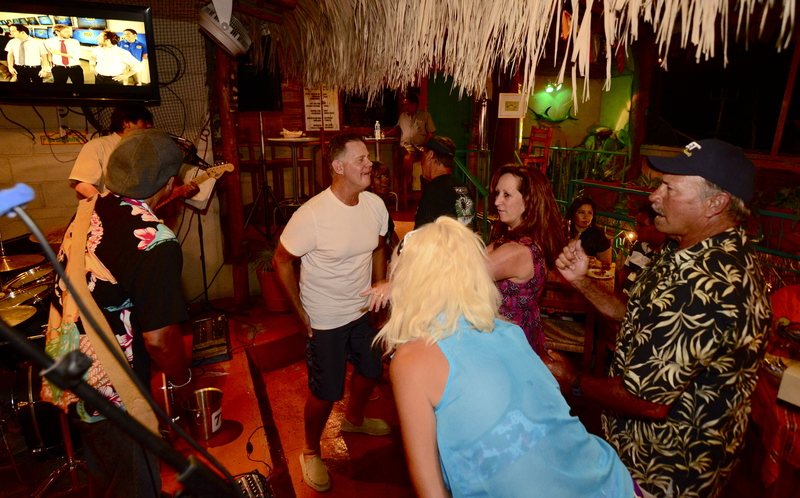 That night, a big awards dinner and more party time at Tailhunters where we hosted an all-you-can-eat Hawaiian rib dinner and more dancing on the 3rd deck to the classic rock of “Benny and the Sons of the Beaches.” All-in-all, just a great time with so many good friends! Thanks to all, but especially, Pat McDonell and Western Outdoor News and their staff and Gary Graham for above-and-beyond being a good-guy to us. WHOAAA!!!! That’s a big fat rooster! 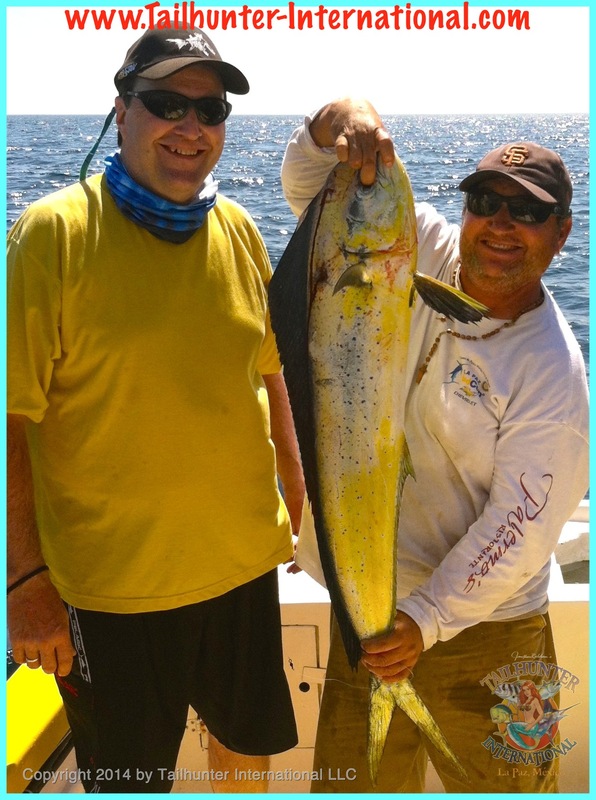 Captain Jorge helps out Robert Rost who was fishing with us for his first time from Boise, Idaho! 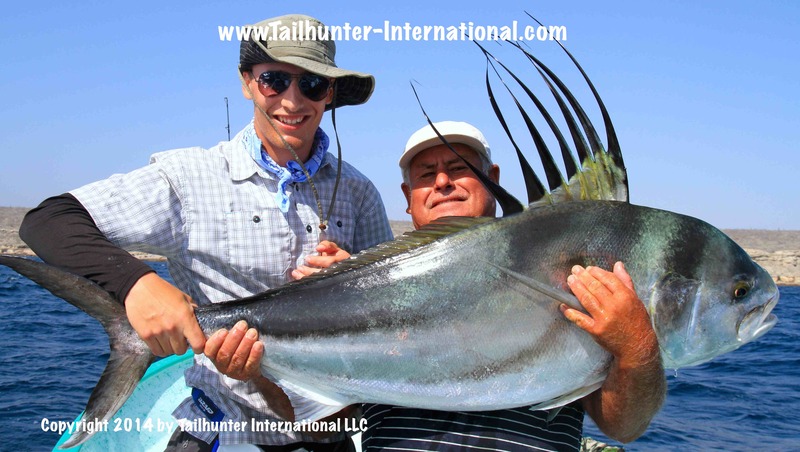 Robert had super week topped by this huge rooster they caught and released near Punta Arenas! That’s a big wahoo for Ty Mitchell from Washington on his 2nd trip with us. 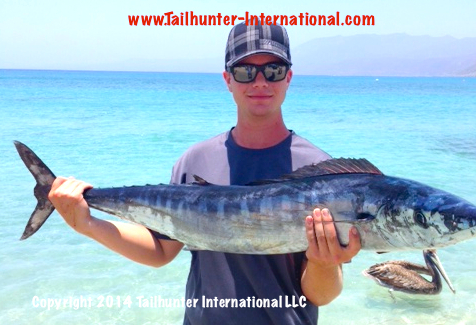 He got this trophy off Cerralvo Island fishing with our Tailhunter Las Arenas fleet! Captain “Fettucine” Alfredo from our Tailhunter La Paz fleet photobombs deckhand Blas posing with our amigos from Colorado Doc Art Flippin and son-in-law Mike Shepherd! Tiffany FLOYD could NOT have been a more fun person to come down to fish! 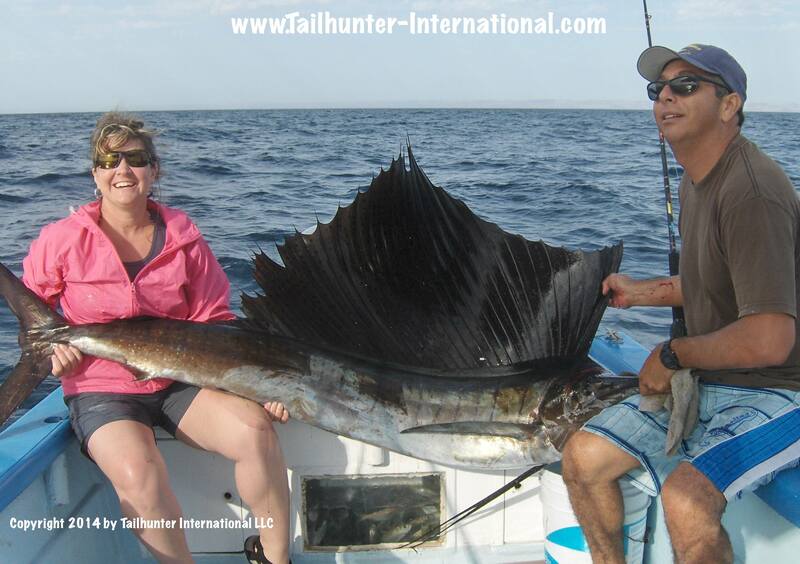 I don’t think she ever stopped laughing or smiling and this big sailfish with Captain Joel put a big smile on her face. 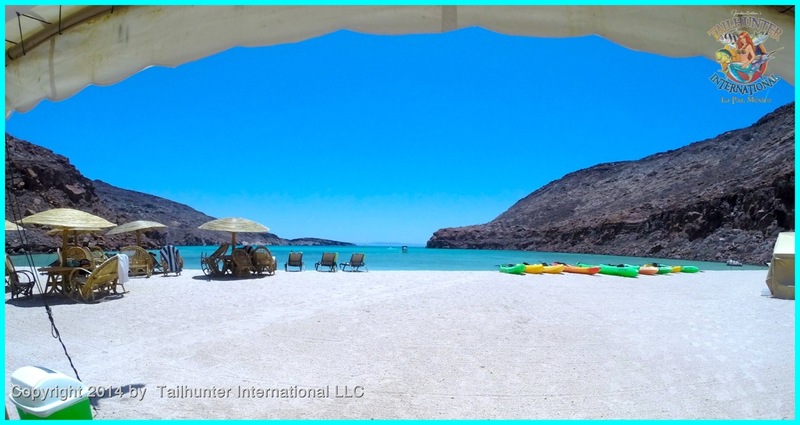 She was down celebrating her anniversary and she caught this just outside La Paz Bay! OH the joy! This is just pure ecstasy! 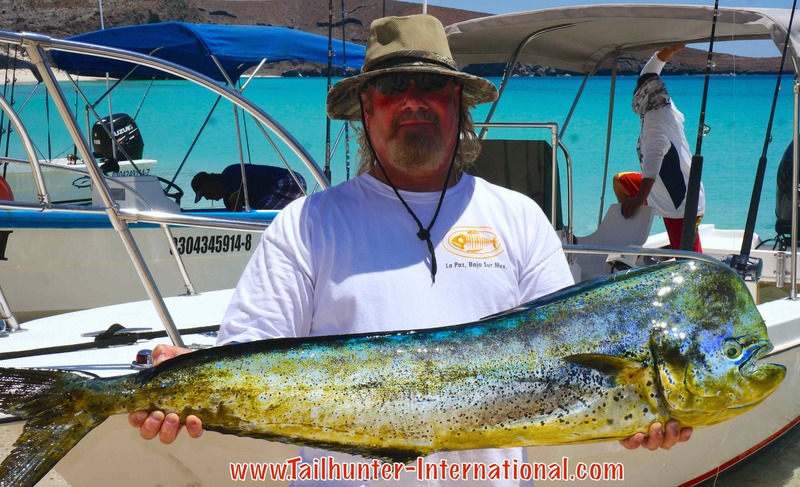 Mike Shepherd had a great week with us, but a big dorado eluded him all week. 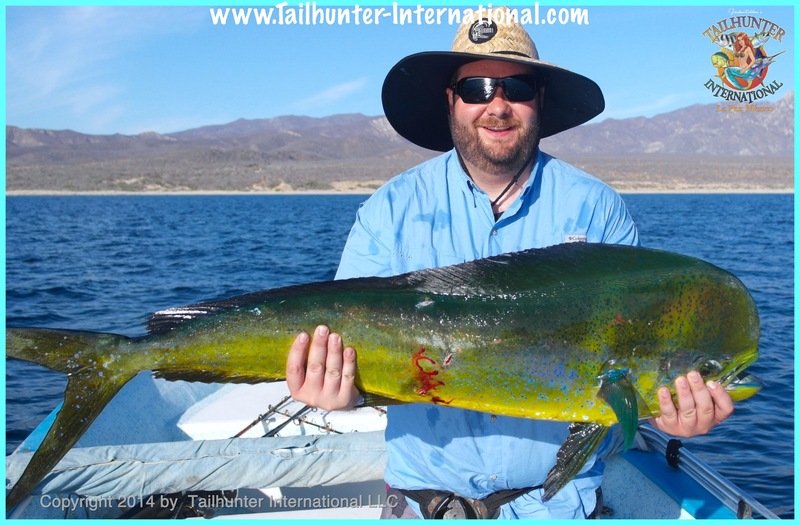 But at the last hour with almost his last bait on the last day, he finally put the wood to this nice bull dorado! Great facial expression, Mike! CLASSIC! I think this should be their new 2014 Christmas card photo! The Nichols family run a big time fishing operation out’ve Florida and came down for a few days to visit. 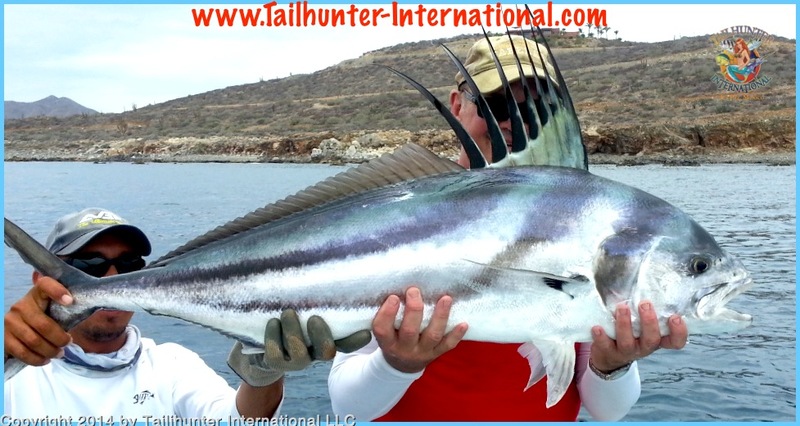 They all got and released their first roosterfish plus some nice dorado including this trophy bull that ended up for dinner at Tailhunter Restaurant! Dennis Cudal knew this one was headed to the grill when he stuck this nice big barred pargo around Espirito Santo Island. Check this off the bucket list! 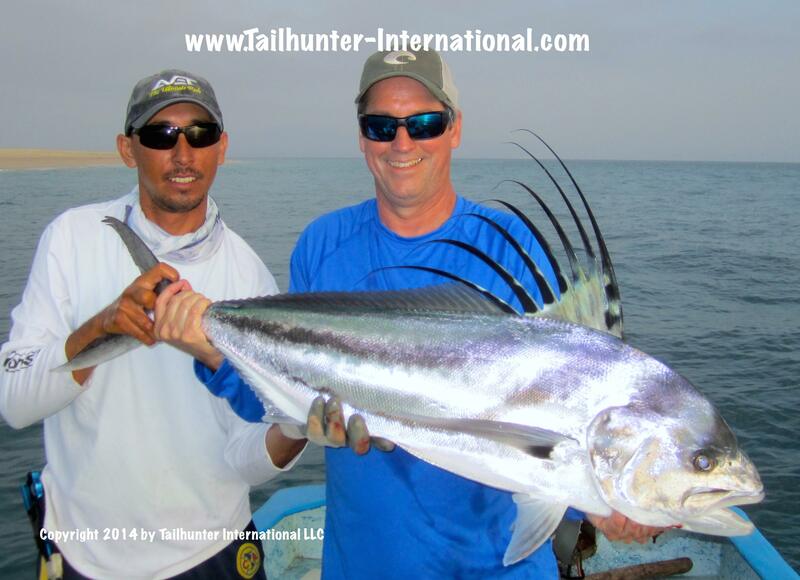 Nothing like an exotic roosterfish on the line! Jeff FLOYD from Idaho, was fishing with Captain Pancho literally just a few yards from the beach at Las Arenas and caught and released this big time rooster! 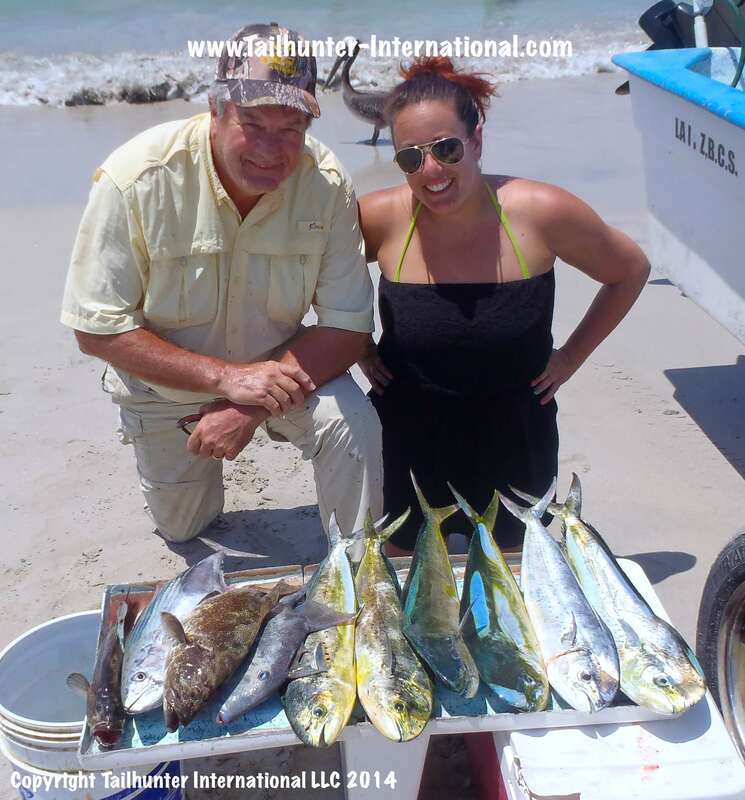 An extended Father’s Day Week plus graduation present for Craig and Ashley Sanford from the Phoenix AZ area where they show off quite a variety of fish they caught with our Tailhunter Las Arenas fleet including cabrilla, bonito, triggerfish and dorado! Great story. Mike Shepherd was trolling a big bait in the shallow waters near Punta Perrico when his rod went off and all heck broke loose. He started yelling, “MARLIN! MARLIN!” Captain Jorge was tying up some lines and not looking and said, “There’s no marlin here!” Until he looked up! MIke had on a fish estimated at well over 200 pounds! Unfortunately, only 30 pound test so they hung on as best as they could while wife, Candi snapped photos! Folks ask all the time for “bigger boats” so they can go out further and catch “bigger fish!” Well, as you can see, we don’t have to go far and our pangas do just fine! 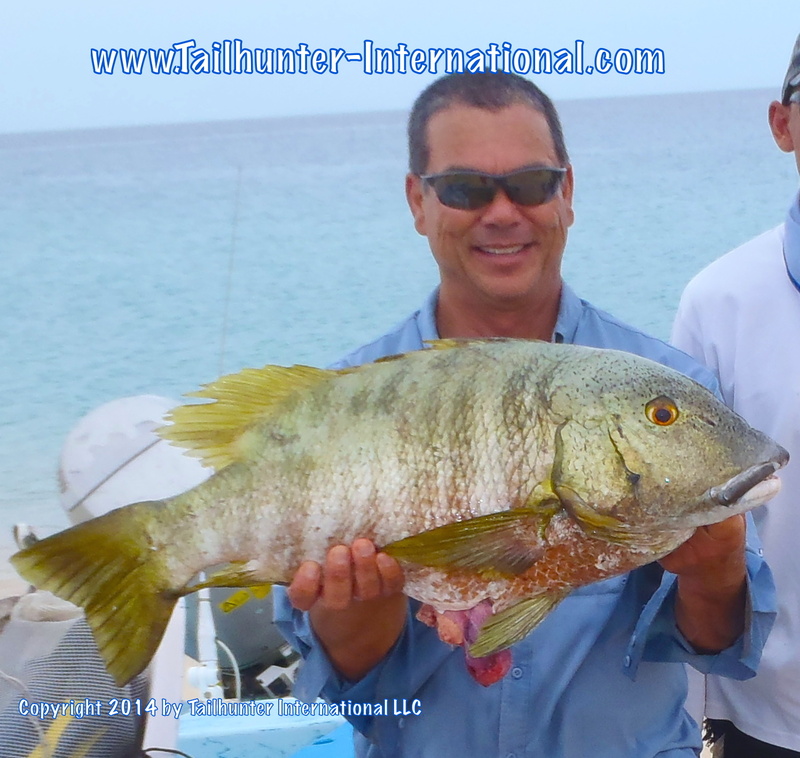 Our good amigo, Don Busse, always does well and he put this big pargo on board at Las Arenas and ended up bringing it to our Tailhunter Restaurant for dinner! It was a good week for big barred pargo! 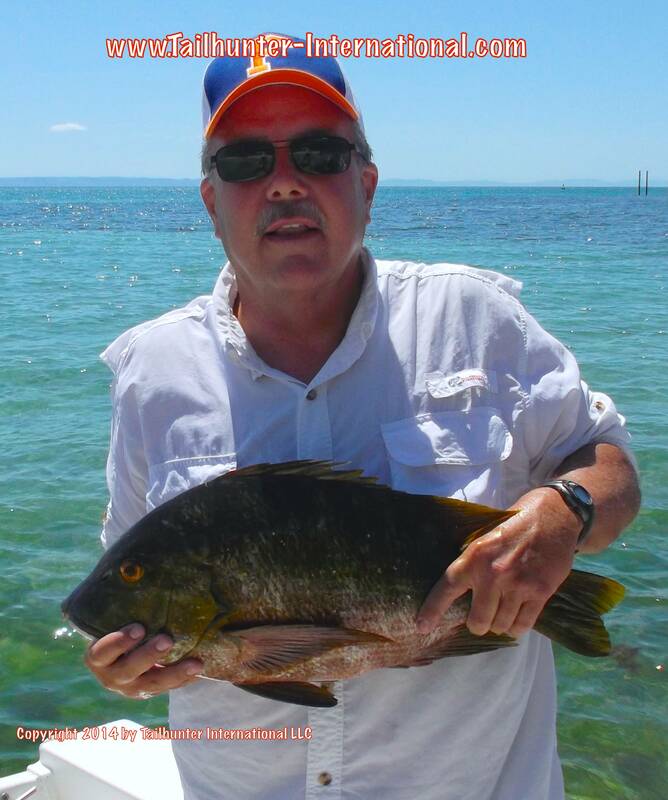 Al Nojadera has been fishing with us for alot of years and shows off one of his big pargo. Gary Pilkington is from Northern Cal and fished with Captain Pancho. Gary was on his 2nd visit with us and wanted to get a rooster! Mission accomplished with this caught-and-released trophy! Luke Appel from Malibu took a nice picture and a great photo of this barred pargo in full raging colors! These are tough tough fish when hooked and fight like beasts! 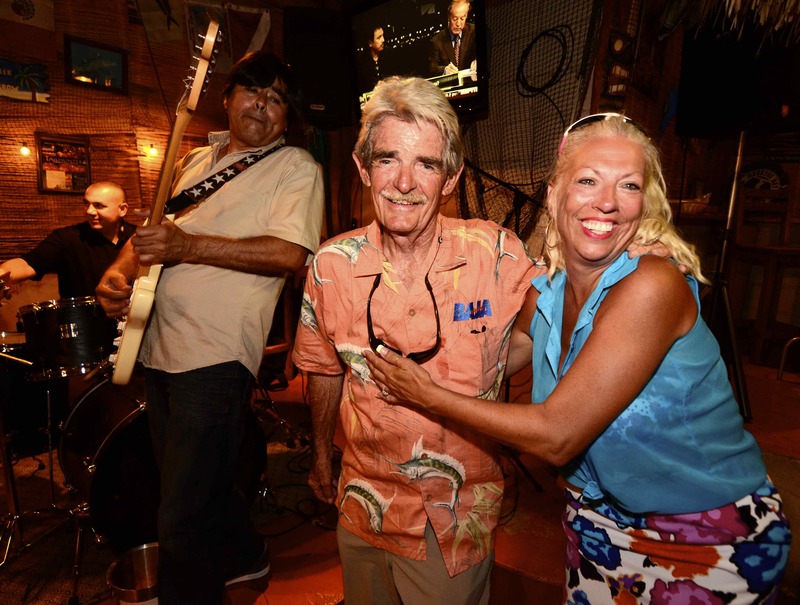 This is our rockstar, Rick Kasper, who always gets fish with us. 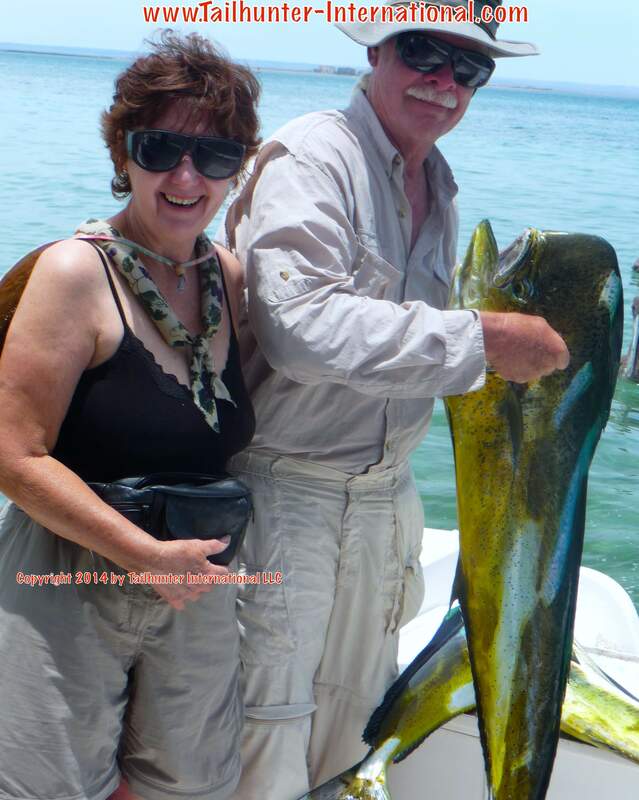 Rick has a place our there near La Paz now and spends several weeks hanging out and fishing! 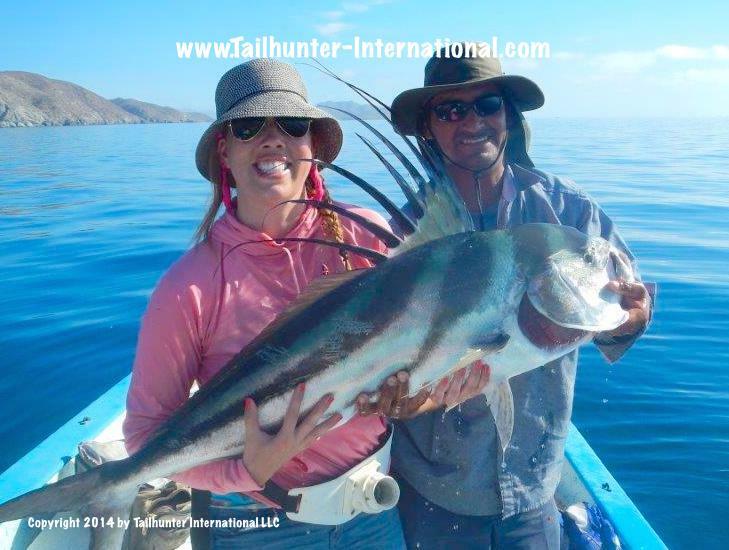 Captain Adolfo and Megan Kennedy with another colorful rooster onboard and flat blue waters behind! The fish was caught and released. Megan was on her first trip and came down with dad. This is just a super fun photo! 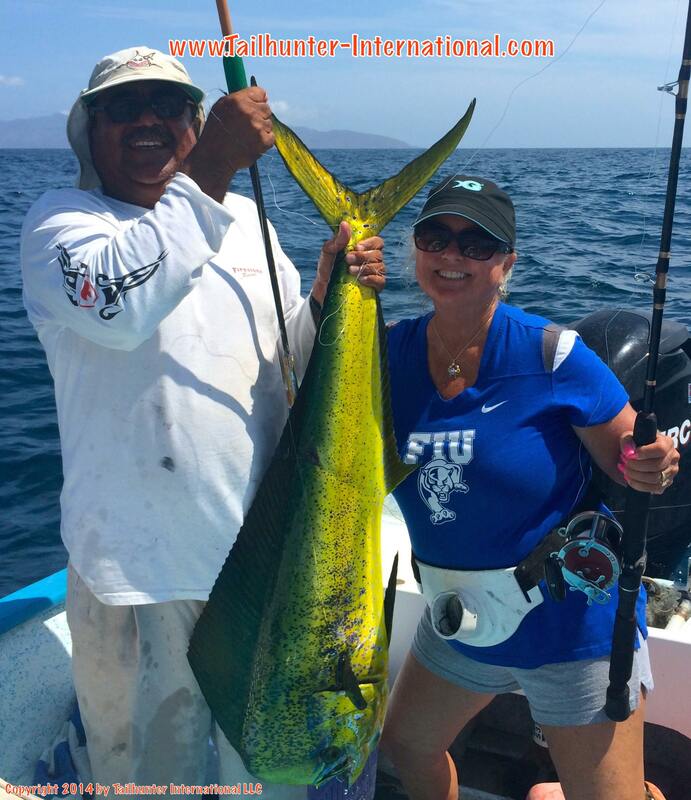 One on board and another on the rod for Tiffany and Jeff Floyd celebrating their 19th anniversary with a trip to La Paz! 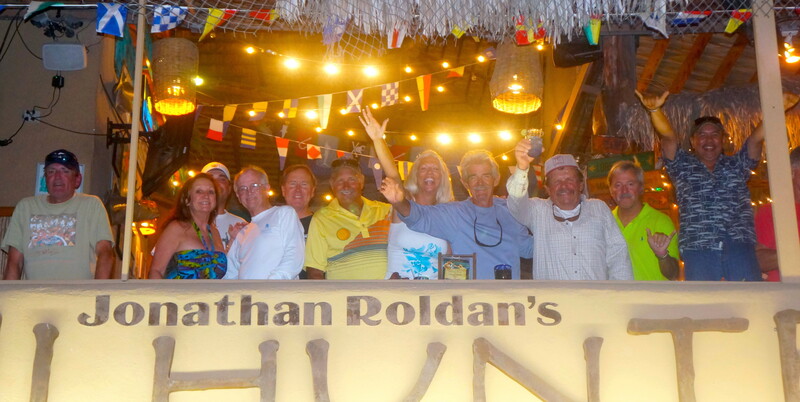 ROOSTERS DORADO LIGHT IT UP WITH THE FULL MOON…AND ANOTHER MISSED HURRICANE! Another fairly solid week of fishing even with the full moon…even with another hurricane missing us and blowing out to sea (Christina! )… but the difference between our anglers who fished with our Las Arenas fleet and those who fished with our La Paz fleet was like night and day…in a good way! Fortunately, for us, our clients get to fish both sides if they so choose! For Las Arenas, at times, the winds plus the big swell generated by hurricane Cristina far to the south had to be contended with and made for some bouncy days, especially towards the end of the week. The hurricane was up to a category 4 with winds up to 170 mph, but thankfully banked out to the west before it got up to the Baja. However, it still pushed residual winds and waves our way and up the Sea of Cortez. The surfers at Land’s End by Cabo and also around Todos Santos were loving the big waves with the thick lips! But, at Las Arenas, we continued with swarms of little dorado. So many that some of the anglers are calling it “the nursery” where it was not uncommon to hook and release a dozen or more dorado in short order of fish no bigger than 3-5 pounds! Great light tackle action, but very few fish larger than that. The good thing is that the way dorado grow, in just a few months, these fish will be 15-20 pounders! So, it’s good that many are getting released. The better action was on the wahoo, especially earlier in the week when that area south of Cerralvo Island kicked out another nice jag of 20-40 pound speedsters on trolled lures like the Rapala X-Raps and Yo-Zuri Magnums. For every fish taken, at least 2 more were lost so there’s some fish out there. The other part of Las Arenas were the big roosters that seemed to pop up again with a vengeance. We had several days mid-week when, as one angler said, “Every bait thrown in the water generated an immediate hammer from a big rooster!” The fish this week were as “small” as 35-40 pounds, but we had some larger estimated in the 60-85 pound class (by the captains!). 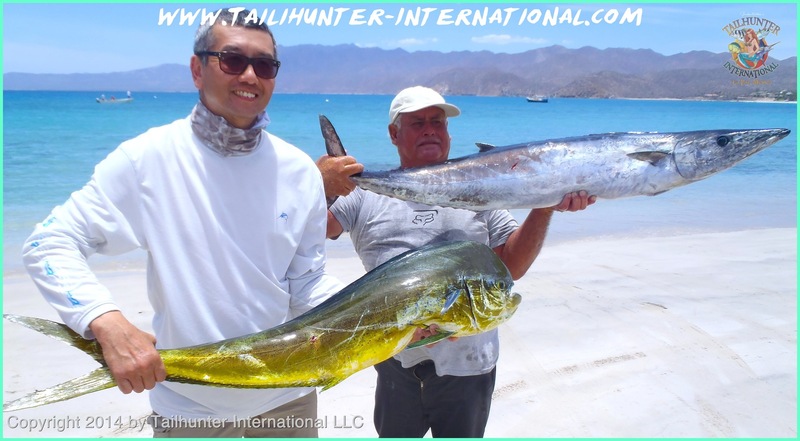 For La Paz anglers, it was a completely different story altogether! 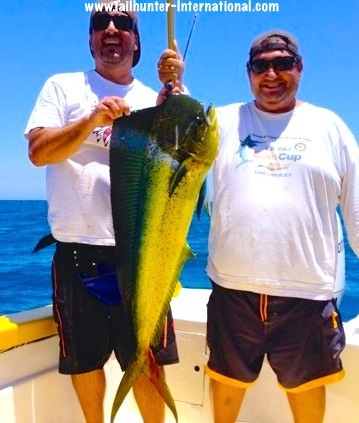 The dorado were bigger. They were more abundant and they really bent rods and went 15-40 pounds with some larger ones lost. The bonus was the many of the best bites were literally right in La Paz Bay or just outside without having to go very far. As well, where the smaller dorado were found, marlin and sailfish were in the same areas either eating the same baits or else feeding on the small dorado themselves. 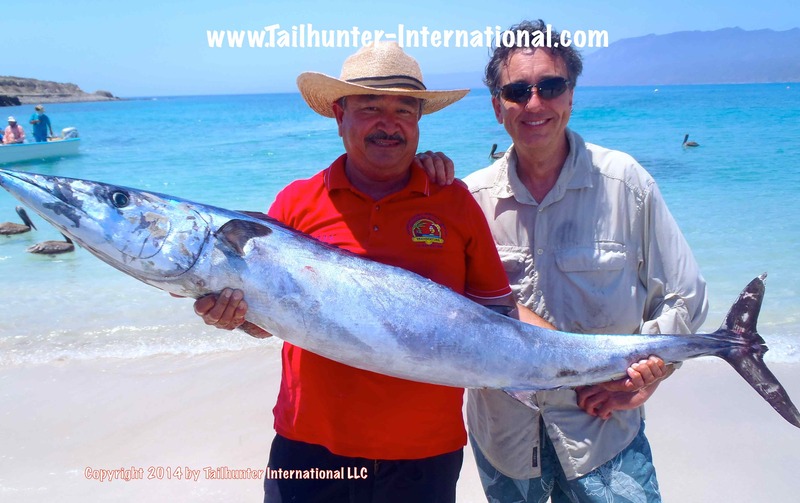 All hail the “Wahoo King!” Mike Guest from Phoenix Arizona has been coming to fish with Tailhunters in La Paz for years and never got a wahoo despite great efforts. 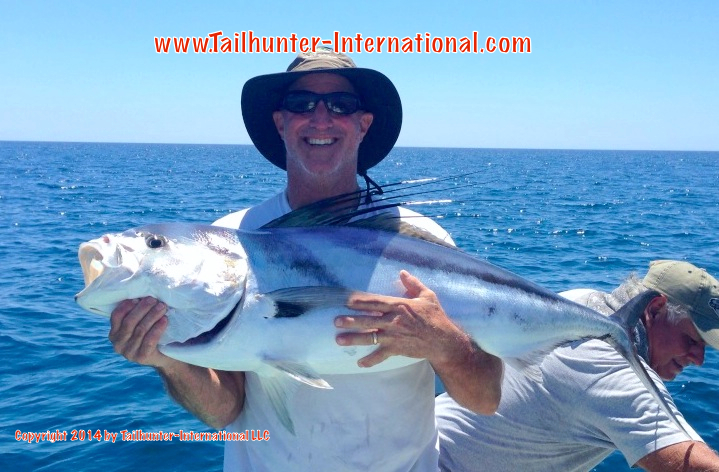 This past week after only two days he got three wahoo and lost two other, but did get this one huge beast estimated at 60-70 pounds near Cerralvo Island. Amigo, Esteban Romero, gives a hand! Cole Chavira from Solana Beach CA always smokes the fish here in La Paz since he was little kid. He’s now in high school and nothing changes. He put the wood to this big cabrilla on a deep jigged yo-yo iron! He came all the way from Lisbon, North Dakota, but Joe Nelson told us, “It’s been as cold as 30 degrees below zero back home” and he wanted some sunshine and his first rooster fish! 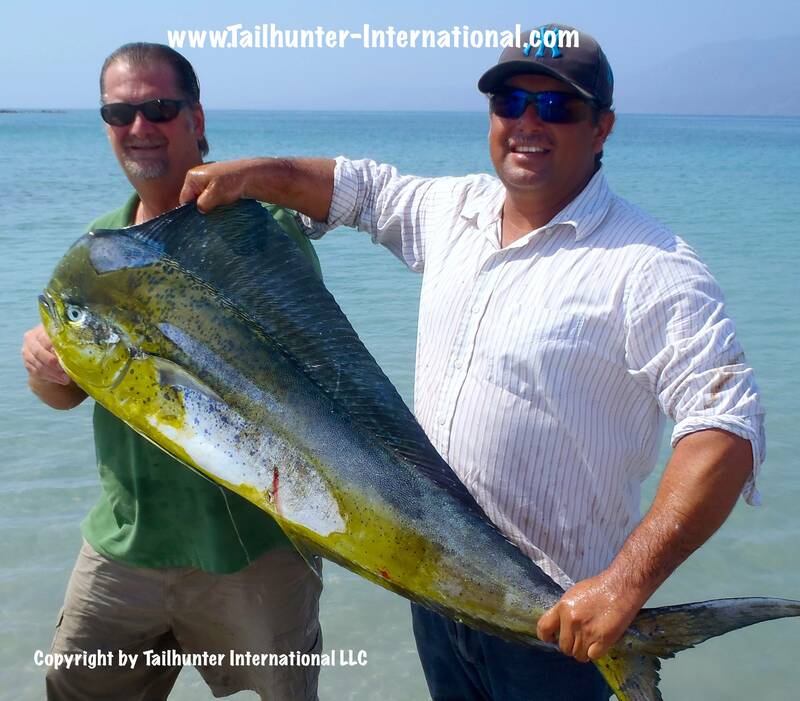 He got both including this fat rooster off the rocks at Punta Perico with Captain Archangel of the Tailhunter fleet. 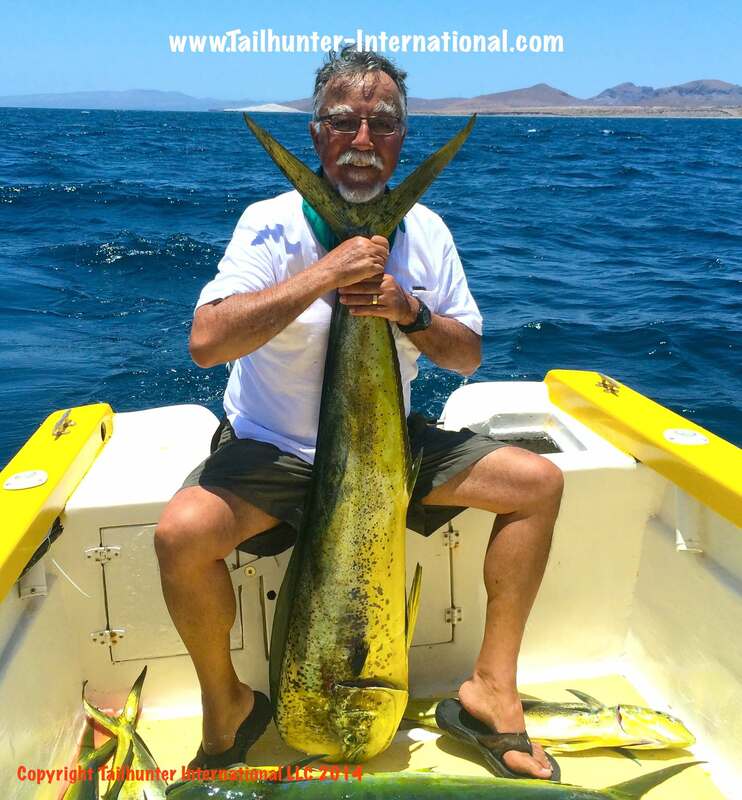 Al Rodriguez has fished in La Paz and Baja but NEVER got a dorado so he really focused on one this past week. He did that…and MORE! Well done, Al. 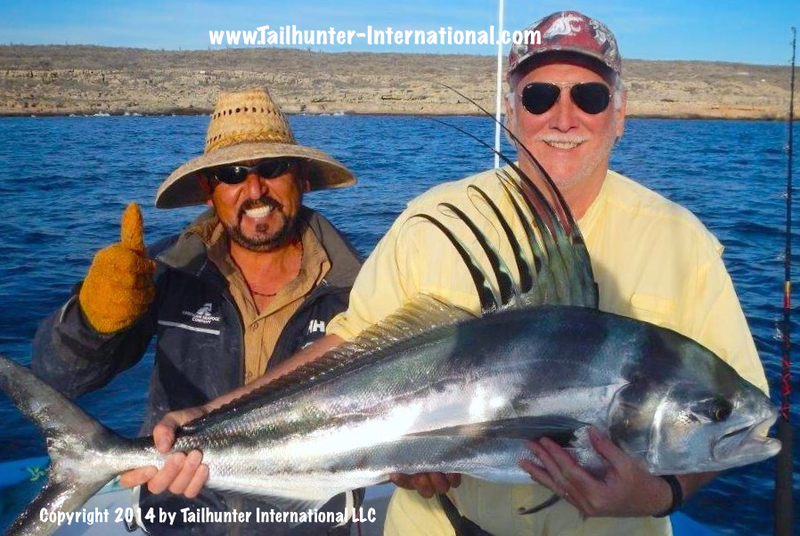 He nailed this nice bull just outside of La Paz Bay. Malibu in the house! 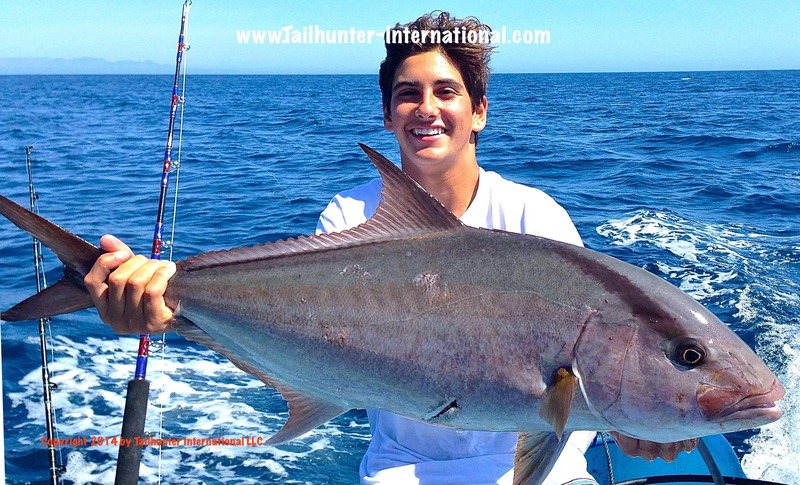 Luke Appel dropped the hammer on this sweet amberjack off Isla Espirito Santo on a heavy jig north of La Paz. 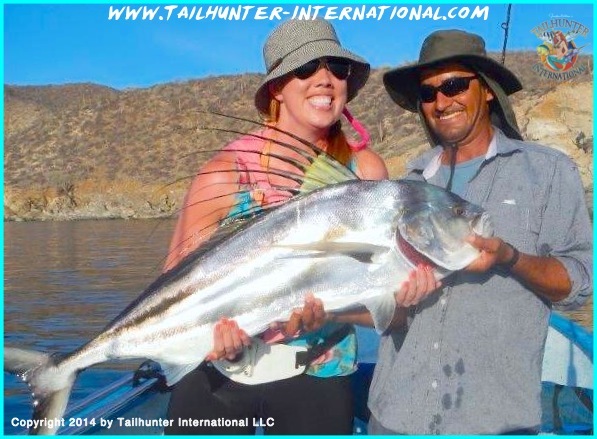 Captain Adolfo from the Tailhunter Las Arenas fleet helps Megan Kennedy from Washington with the smiles and a big roosterfish just off the rocks outside of Bahia de Los Muertos! The fish was released! Gabe Rodriguez was in town with his dad and to celebrate his 40th birthday doing some fishing. 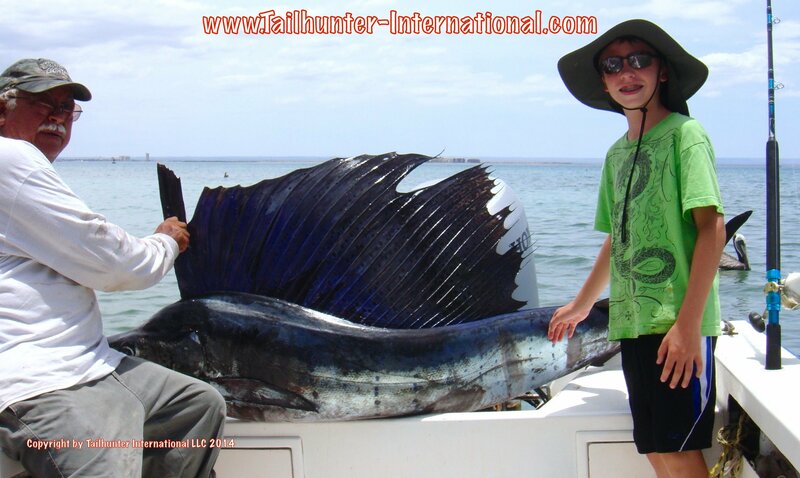 He and dad both got into the dorado with Captain Rogelio of our Tailhunter La Paz fleet. Feliz cumpleanos! Happy Honeymoon! 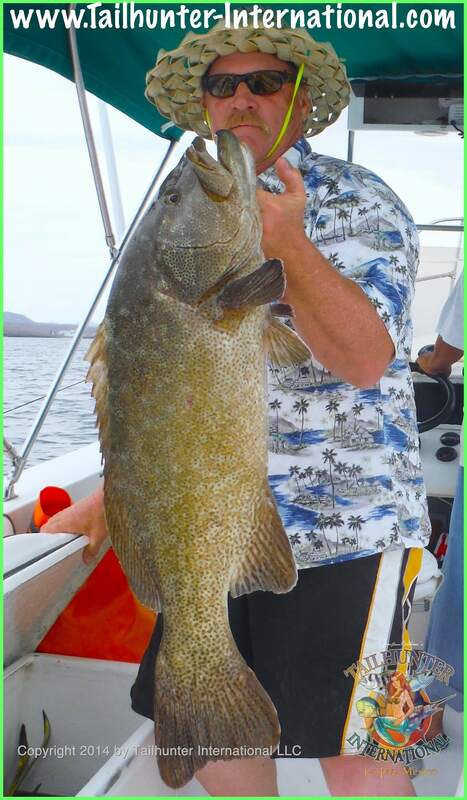 Pat Snyder from Orangevale CA said this fish “beat him up” for 30 minutes while fishing with Captain Armando. He was here on his first trip to La Paz and to celebrate his first week of marriage! 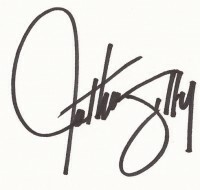 Congrats to him and Kathy! 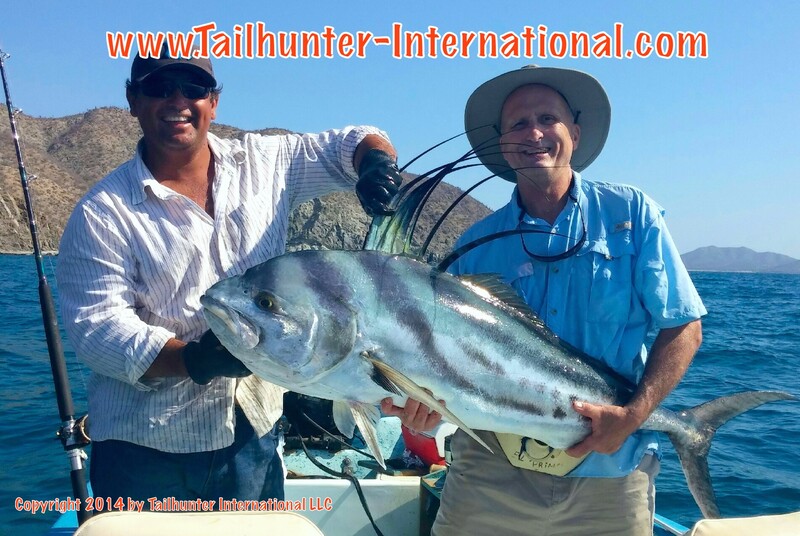 A well-deserved “thumbs-up” from Captain Jorge to pose with Kevin Kennedy and his big roosterfish that he caught and released not too far off the little cliffs at Punta Perrico. Our amigo, Kevin, is from Washington. 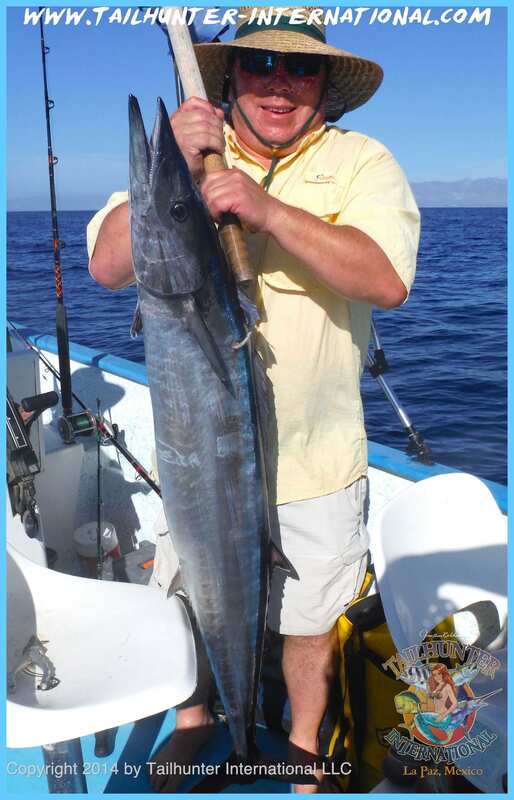 Colin Reed from San Diego with a speedy wahoo he caught off Cerralvo Island where the wahoo bite has been pretty steady for several weeks! 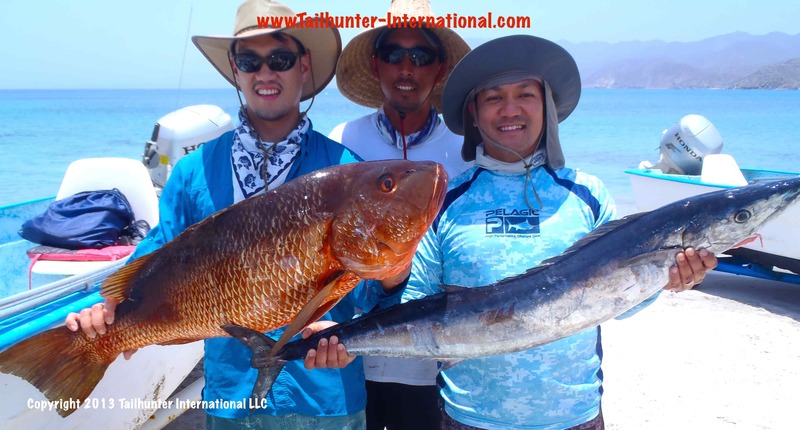 Pretty good for a first day fishing and first time to La Paz for brothers Andew and Ian Vale Cruz from San Diego. They got a variety of fish including these two trophys. Andrew holds up a big dog-tooth snapper and Ian has his first wahoo. Captain Pancho fails the photo bomb! 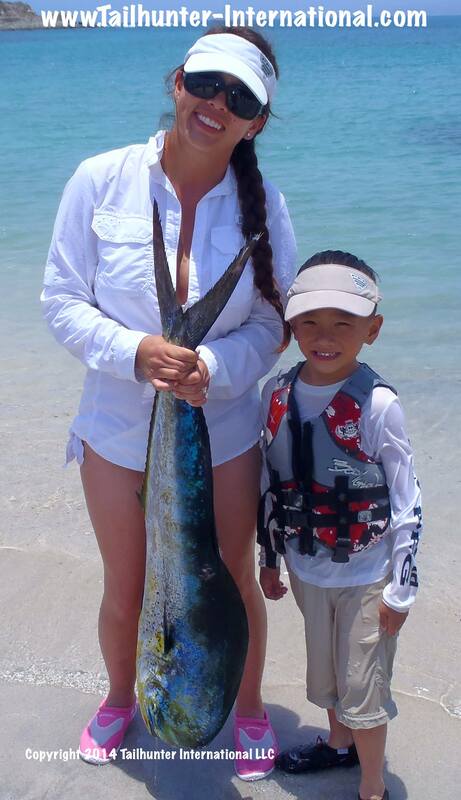 Everyone was in on the dorado bite including amiga, Nina Duc Le and son, Will, from Albuquerque, New Mexico. Over 3 days fishing they got marlin, dorado, bonito, and others! THAT’S MORE LIKE IT! FISH BITE! RODS BEND! 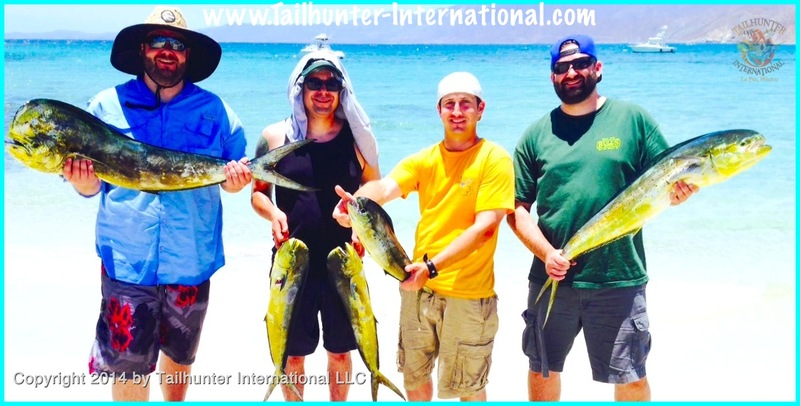 Good solid fishing this week for both of our Tailhunter Fleets for once. Usually, either the La Paz fleet is doing better than our Las Arenas fleet or vice versa! However, this week, I would have to say that for once, we had alot more consistency which made for some good catches and action for our anglers although here and there, some anemia still persisted. Basically, some boats did better than others on a given day. But, overall, everyone got fish. For our Las Arenas anglers, the big news continues to be the wahoo bite around Cerralvo Island with some bruiser wahoo literally hammering the Yo-Zuri and especially the Rapala X-Rap lures which seem to be the season’s new-found “hot lure”. Run ‘em deep and they get bit! I gotta say, there’s gotta be some big time wahoo underwater because even with wire, some of the lures are still getting bit off. And…get this…we’ve had some lures literally getting CRUSHED! I mean, how often do you ever hear of a hard-bodied lure like a Rapala getting broken or even smashed by the teeth! Or the treble hooks getting straightened out! That’s a big mean fish that can do that! We had several fish this week tickle the 50-pound mark and even one estimated at 70 pounds! The other benefit of these deep running X-raps that can run 30’ down is that we’re actually getting some huge pargo on them! (By the way, I am NOT a rep for Rapala! Prior to this, I actually liked the Yo-Zuris better because the older metal-lipped Rapalas got “out of tune” too easily after a bonito slammed them. But the new ones have acrylic lips that dive deep and don’t get all screwy!). For dorado at Las Arenas there were polar opposites. 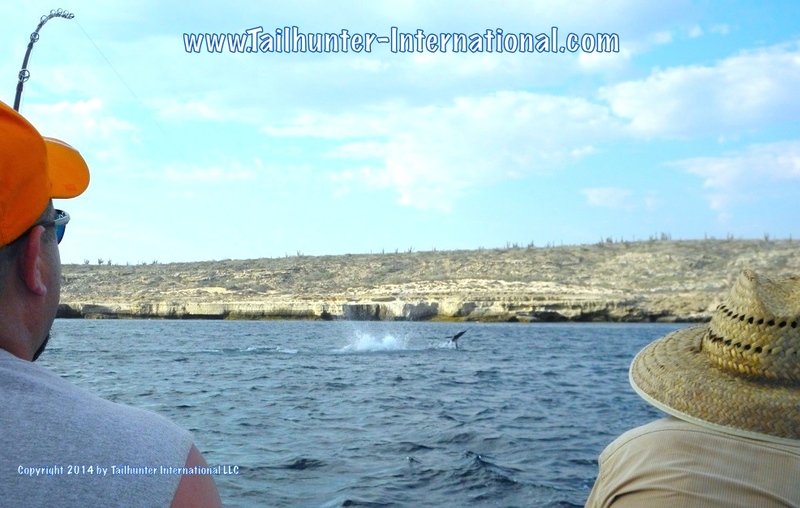 There’s a spot we’re starting to call the “nursery.” There are so many 3 to 8 pound dorado there that you can hook a dozen quite easily and the flyfishers and light tackle anglers are having a blast. Beyond that, there’s very little in between. The dorado then jump up into the 25-30 pound class! There’s a few out there and bigger ones as well. For our La Paz fleet, dorado are the name of the game. 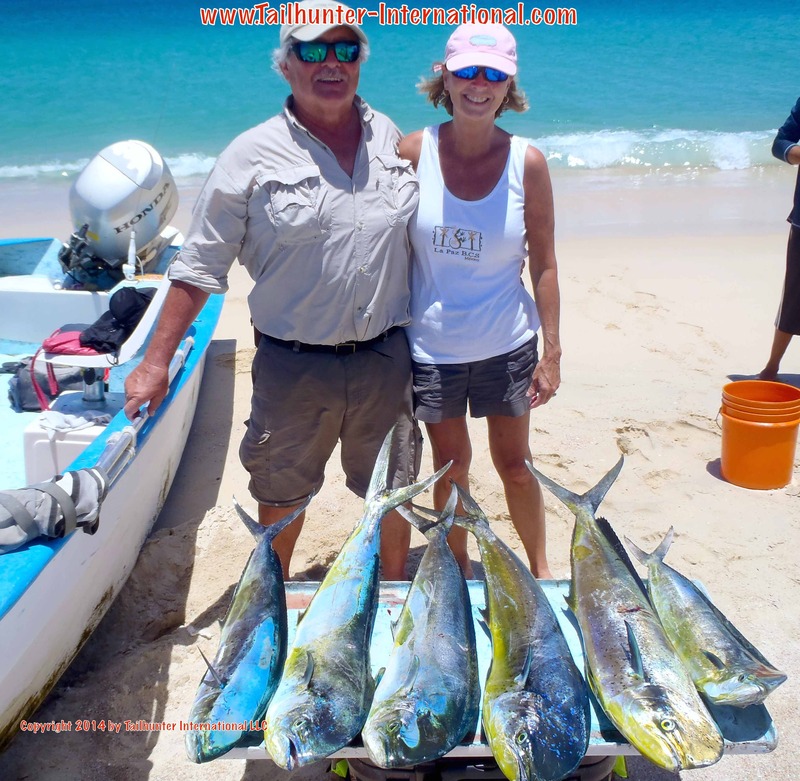 Limits or near limits of 15-40 pound fish are just inside La Paz Bay and some of our boats actually quit early and came back with anglers saying “no mas!” Full fish boxes and ice chests after a few hours fishing were not uncommon. Other anglers not doing as well, still had opportunities with quite a few fish lost to either inexperience or simply tough luck…but still plenty of action! On a final note…alot more marlin and sailfish hooks ups this week with more billfish entering th area. By my count, our two fleets hooked perhaps a dozen billfish of varying sizes including one blue marlin and the rest being 100 pound stripers and sailfish. One fish brought in and the others either got un-bottoned or released.